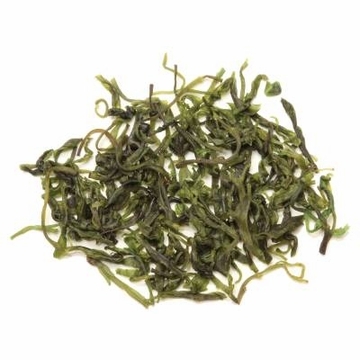 This is a rare and expensive tea grown in Zhejiang province. 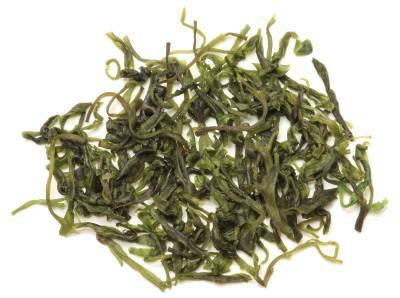 In Chinese medical journals the Tianshan Lushui is known to lower cholesterols and help with weight loss. This tea produces a green color liquid. The better its quality is, the greener the color. This tea has traditionally been used as a diet tea in palaces by the empress and princesses of ancient China. Because this tea is very concentrated, we suggest using one teaspoon of tealeaves for every 500ml of water. Free shipping with purchase over $60. Bitter in a refreshing way! This tea steeps to a brilliant green that is pale and clear. It is certainly bitter, but is happily countered with a bright, grassy scent (maybe a little citrus). A little goes a long way with this one. I like it a lot. I love bitter flavors. Like bitter chocolate, bitter hops in beer. I bought this to try and was willing to spend the money, it is pretty expensive. I just did not like it. Even for me it was over the top bitter and it did not help even if I had a shorter brew time. I thought this is what some witch doctor would give you to drink to heal whatever aliment you might have. I prepare this tea very weak because it is bitter, as the title suggests. i believe this tea has healthful properties for the body and i use it when i want to alkalize my body and boost my immune system. personally, i can feel a difference when i drink this tea - i just feel better. It is not sweet and i don't think i would like it too strong, but just a wee bit for a short time goes a long way. it is a good tea to have on hand and i am glad i purchased it. Yes, it is wild and it is bitter, and I drink it every day. The key is to use a small amount -- I use about a half teaspoon in a 6 oz cup. Though the tea is bitter and takes a little getting used to, the after-taste is quite pleasant, not bitter at all. this is an herb, not Camellia Sinensis tea plant, good however ! It is not *true Tea* from the Camellia Sinesis plant, however, I like this because of the health benefits. If you find it too bitter, add a little lemon and honey to it. Will buy again. You have to enjoy bitter... or add sweetness of some kind. I tried this tea with much excitement. It was one of the prettiest teas I've ever steeped. The leaves unfurl reveling what looks like fresh grass cuttings. Beautiful shade of electric green. Smells like a fresh spring meadow. Makes you pause and enjoy the color and rich smell. Heaven! But I drink my tea straight, no sugar, honey, or agave. This is my mistake. I think this tea must be served with something and not straight up. At first sip I thought I was nibbling on bark! For such a sweet smell I was caught completely off guard with the very bitter flavor. Yes, it is wild and it is bitter. Must add sugar next time!